The latest Land Registry monthly release tells us that in March 2013 there were 52,090 house sales in England and Wales. In March 2012 the volume was 61,334 a difference of -15% in 12 months. 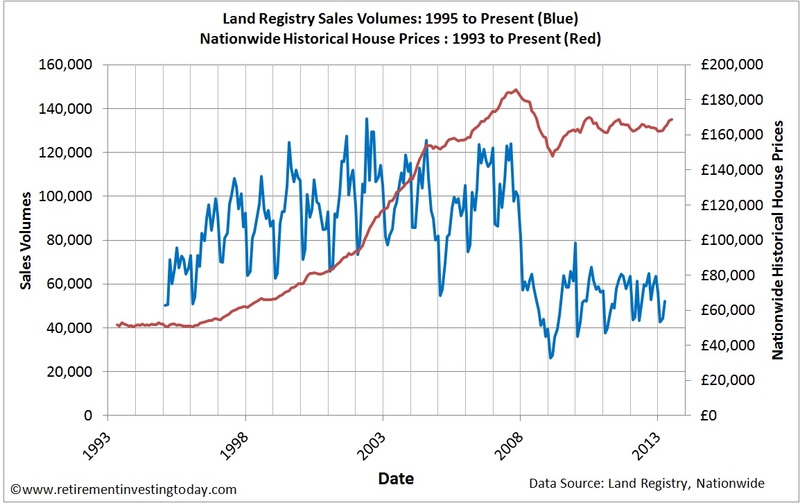 Volumes are also only 38% of the peak volume seen in May 2002 and 64% of the long run average of this dataset. Meanwhile house prices seem to be doing not much more than the dance of a damped sine wave since 2007. So even with plenty of market manipulation including the Funding for Lending Scheme (FLS) and Quantitative Easing (QE), which have driven mortgage rates to record lows, this is the best that the Bank of England and UK Government can muster in terms of a market. This is all shown in my first chart today. This all looks pretty bad but it wasn’t until I read the Land Registry May 2013 HPI Statistical Report that I realised for normal people there no longer really even seems to be a market. The table below shows the sales volumes by price range. 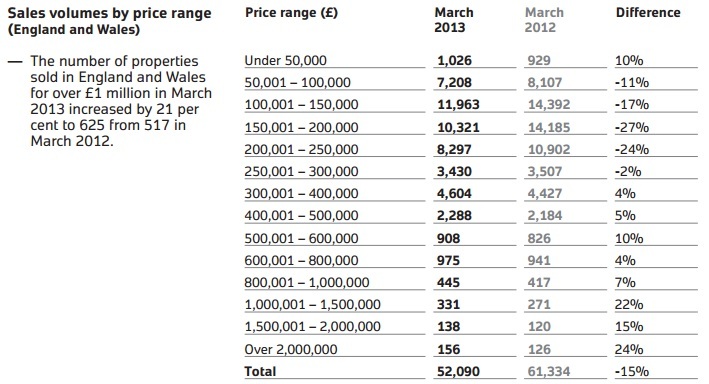 Look at the volumes for houses priced between £100,001 and £250,000. They’re down between 17% and 27%. 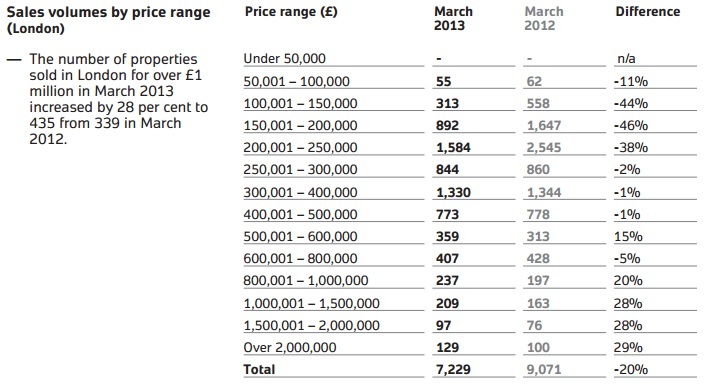 In stark contrast volumes for properties greater than £1,000,000 are up between 15% and 24%. Jump to London and its insane house prices and the market is even more finished for all the Average Joe’s out there. Between £100,001 and £250,000 volumes are down between 38% and 46%. In comparison if you’re looking to spend over £1,000,000 then you have some competition with other would be “wealthy” future house owners with volumes up between 20% and 29%. The powers that be clearly think that given they have driven mortgage rates to the floor that the problem is now no longer affordability but lack of a deposit. Enter the Help to Buy scheme with part one having kicked off in April. We have to wait until January for part two. Will this latest distortion finally get the market moving or alternatively is my very simple hypothesis that house prices are just way too expensive for the Average Joe more correct. What do you think? Run do not walk to the exit. The UK is nailed on dead! They are painted into a corner. I agree house prices are way to expensive for the average Joe. Maybe this is the normal position from now on with the minority owning property rather than the majority, hence continuing low volumes. Historically this was the case and I believe still is in much of Europe. Once the stigma attached to renting goes away then maybe the obsession with house prices will go with it. Changing Assured Shorthold Tenancies to something that gives the renter an opportunity to make that rented house a home would be one way to start removing that stigma. I wrote on here before that I felt we might have passed "peak housing" and someone complained it was a silly comment. Especially now that wages are falling and all the wealth is going to the already rich? Even if you manage to buy and pay for a house in your lifetime the government takes another 40% in inheritance tax when you die and the next generation has to start again from an even worse position. To look at things from a negative perspective. On a serious note I know that I'll eventually be buying as the UK Assured Shorthold Tenancy process seems deliberately designed to keep renters on edge and certainly restricts a house becoming a home. That's all I'm looking for. A place my family and I can call home. I'm currently starting to look at UK home options but really do refuse to buy somebody elses overpriced house, sorry "pension". If I don't find something in the UK by the time I reach Financial Independence then I'll also start looking within Europe. Once you reach your concept of "financial independence" you no longer have to live near a highly paid job, so whats stopping you? I second anonymous. Once you reach FI you don't have to be within commuting distance of work. There are a lot of lovely corners of this sceptered isle that aren't close to professional employment opportunities. Thanks for the hint to look outside of the South East. It is something I will definitely be doing and in fact have just started to assess. You may have noticed the recent posts analysing counties and regions within the UK. Additionally I've been using a little of the summer to explore some of those other regions. I'm in no rush as I'm still a couple of years away from Financial Independence. We've been having similar conversations about this recently. The other benefit is that many of the lovely corners also have a bit more land available, which I know is important to both ermine and RIT. As I've already bought an overpriced house in an area full of high paying jobs, one option in FI would be to rent it out as part of a balanced portfolio of income generating assets. I do think it may be emotionally difficult, however, to spend all those years living in that expensive place and then, at the time of pressing the nuclear button, also move away and therefore cut yourself off from your social circle at just the point when stopping work creates a big void in your life. It sounds like we might meet each other at an open house sometime in the future. Shropshire, Herefordshire and a quiet part of Suffolk are certainly on my current investigation list. As you mentioned I'm also hunting for a little land for some self sufficiency which these areas seem to have a bit of for prices that I will be able to afford. Some really interesting observations here. I live in a relatively cheap part of the country and work in a relatively well paid industry and yet I see middle manager colleagues who are still not able to afford a suitable first house and have been renting for many years. So even outside of London house prices are still way too expensive. Something has got to give or as you say we will become a nation of long term renters. Rather than directly meddling with the housing market with FfLS which has negative impacts on Savers Interest Rates and the like the government should stop the developers from sitting on land-banked sites with planning permission by levying a tax where they remain undeveloped for a defined period. They should also make more efforts to support a self-build market in this country with serviced plots as found in many parts of the EU. This would result in far more construction projects, helping the construction sector and might even result in some architecturally desirable houses and developments which people actually *want* to live in rather than the boxes they market as 'homes' these days. That in turn would pull more people back into the market and help housing stock liquidity. I'm with you on possibly encouraging a self-build market with serviced plots in this wonderful country. I agree that it would be infinitely better than the terrible new build housing estates that we are currently seeing being thrown up across the country. We might even see get some variety along with some architectural beauty as you suggest.